Starting April 1 at Dilworth Park, visitors will be able to once again enjoy Pulse, a unique and interactive public art experience. Follow four-foot-tall curtains of colorful atomized mist across the park’s fountain surface as SEPTA trains pass beneath. 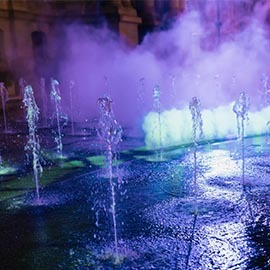 Also on April 1, the Dilworth Park Fountain will be turned on for guests to enjoy and splash in this spring and summer! Air Grille will make its return to Dilworth Park starting on April 1! Dine al fresco while enjoying the seasonal menu at Air Grille. This classic silver Airstream located directly adjacent to the Dilworth Park Café offers American fare, including a delicious Air Grille Cheesesteak, Buffalo Chicken Wrap, Watermelon & Feta Salad, and more. Get in gear for the Broad Street Run with Philadelphia Runner! Whether it’s your first time or your fourteenth, Philadelphia Runner has everything you need to reach your Broad Street Run goals before you get to the starting line. Stop by the Center City store for free shoe fittings and gait analysis and running gear for the largest 10 mile road race in the country. If you prefer shopping as your cardio, visit Sherman Brothers Shoes for their Santoni Sale. Italian brand Santoni shoes will be exclusively on sale at Sherman Brother's shoes for 30 - 50% off while inventory lasts. Experience the best of spring fashion and mixology in Rittenhouse. Numerous Rittenhouse Row retailers will host simultaneous in store parties with cocktails and special drinks from our best mixologists. Parties will include discounts, trunk shows, gifts with purchase and much more. The entire day is free and open to the public. Event maps will be available on rittenhouserow.org the week of the crawl. For more details on the event, visit ShopCenterCityPhilly.com.